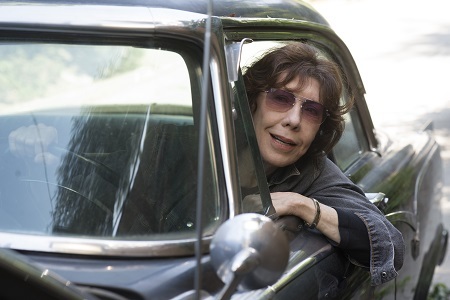 Still stewing over the tragic loss of her longtime partner Violet not so long ago, acclaimed poet and college guest lecturer Elle Reid (Lily Tomlin) unceremoniously breaks up with current, much younger girlfriend Olivia (Judy Greer) for reasons entirely her own. 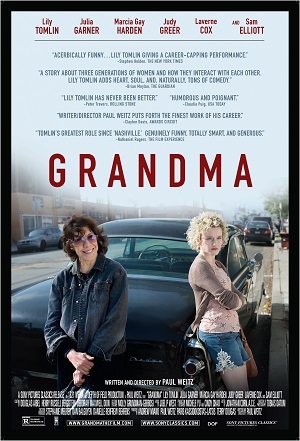 Not long after showing Olivia out the door, granddaughter Sage (Julia Garner) arrives on the older woman’s doorstep in desperate need of $600 before the working day ends. Momentarily broke – Elle chose to pay off all her debt in one fell swoop, destroying her credit cards in the process – the depressed grandmother springs into action nonetheless, putting her own problems on pause as she attempts to help the terrified teen as best she can. Writer and director Paul Weitz’s Grandma is a return to form for the About a Boy and In Good Company filmmaker erasing the bad taste of American Dreamz, Cirque du Freak: The Vampire’s Assistant and Little Fockers in the span of a sensationally well-paced 79 minutes. A road trip drama littered with glorious comedic segments taking place in a single city over the course of only a handful of hours, this is a movie that knows exactly what it is, what story it wants to tell and the best course of action required in order to bring events to a satisfying conclusion. As slim and as slight as the central story might be, the personal stakes are exceedingly high, and the level of insight Weitz uncovers in the interactions between three generations of strong-willed women is extraordinary. The anchor is Tomlin. 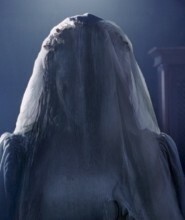 Delivering a performance that by all rights should garner an Academy Award nomination, the veteran actress encapsulates an entire career, maybe even an entire life, lived under the public microscope brilliantly. There are layers to Elle that are revealed bit-by-bit, Tomlin refusing to overplay her hand even when her character revels in her outspoken, larger-than-life personality. In many ways, it’s almost as if she’s revisiting Nashville, re-inhabiting wide-eyed yet plain-spoken Linnea Reese four decades after she stood at the foot of the stage attempting to make up her mind as to what it was she really wanted from life. Elle never apologizes for who she is, doesn’t feel bad about doing what she has done to get where she is, and as such it has made her just the kind of well-meaning, take-charge firebrand many would like to be yet so few find the courage to actually become. Regret is key, because in a story where so many say they are sorry, no one ever apologizes for being who they are and that’s significant. Elle feels bad for the way she has treated Olivia. She isn’t entirely happy with how she treated her own daughter, dynamic corporate workaholic Judy (Marcia Gay Harden). Most of all, she does realize she once did former fling Karl (Sam Elliott) a disservice by withholding certain, highly personal facts from him until the point his input no longer mattered. All that said, not once does she feel bad for sticking up for what she believes in, for doing things in the way she felt was best. Elle knows she isn’t perfect, understands her mistakes, but she’s also comfortable with who she is and the life she’s lived and, as such, while she’s happy to say she’s sorry for the hurt she might have caused that doesn’t mean she’s about to apologize for being her own woman. The same can be said in regards to Judy, Olivia and Sage, each in their own way facing down their own individual demons, doing what they feel is best to battle them into insignificance. Yet all understand the choices they make will be ones they will live with for their rest of their respective lives, a stark truth none shy away from no matter what the problem their respectively battling might be. It’s a level of intimate understanding that’s inspired, everything leading to a quiet denouement of familial togetherness that’s as unambiguous as it is authentic. Weitz isn’t above dipping into melodramatic sensationalism at times, and there are more than a few instances where I was reminded this is the same guy who, along with his brother Chris, brought American Pie to ribald, unabashedly vulgar life. It should also be said that, as big as the themes might be, precious little actually happens in the film, and it isn’t like there are any gigantic revelations made about any one of the principal players by the time things come to their fully anticipated conclusion. But isn’t that the point? As sudden and potentially disastrous as events depicted within the film might be, Elle remains true to who she is and what it is she believes in. She loves her daughter and granddaughter with passionate ferocity, leaping to their aid no matter what might be happening inside her own personal stratosphere. Grandma is a brief snapshot into the life of this opinionated, idiosyncratic woman, nothing more, and in the end that’s exactly as it should be.